A Pterosaurs stand out as one of nature's great success stories. They first appeared during the Triassic period, 215 million years ago, and thrived for 150 million years before becoming extinct at the end of the Cretaceous period. Uncontested in the air, pterosaurs colonised all continents and evolved into a vast array of shapes and sizes. B Until recently, most scientists would not have put pterosaurs in the same class as birds in terms of flying ability. Because pterosaurs were reptiles, generations of researchers imagined that these creatures must have been cold-blooded, like modern snakes and lizards. This would have made flying awkward, as they would have lacked the endurance to power their muscles for long periods of time. C In the past three decades, however, a number of fossil* discoveries have prompted researchers to re-examine their views. The new picture of pterosaurs reveals that they were unlike any modern reptile. From a fossil discovered in Kazakhstan, scientists suspect that pterosaurs had a covering resembling fur. If so, this detail provides evidence of a warm-blooded body that could maintain the kind of effort needed to stay in the air. 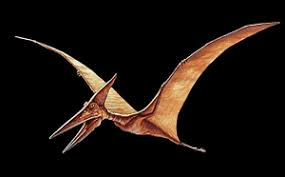 Indeed, scientists now believe that many pterosaurs were gifted air¬borne predators, built to feed while in flight. And, in fact, such controversy has surrounded pterosaurs since the first discovery of one in the early 1700s. D Cosimo Alessandro Collini, the first natural historian to study the fossil and describe it, was unable to classify it. It was not until 1791 that the great French anatomist Georges Cuvier deduced that the animal was in fact a flying reptile, whose fourth finger supported a wing. He named the fossil Pterodactylus, combining the Greek words for wing and finger. A few decades later, the name pterosaur, or winged reptile, was adopted to describe the growing list of similar fossiIs. E In 1873, a remarkable pterosaur specimen came to light that confirmed Cuvier's deduction. Unlike earlier fossils, this new find near the Bavarian town of Solnhofen contained delicate wing impressions, establishing definitely that the extinct reptile was capable of flight. Even though over a thousand pterosaur specimens are known today, such wing impressions remain rare. Normally only bones survive the fossilisation process. F But how pterosaurs learnt to fly remains a matter for disagreement. Most researchers conclude that pterosaurs are descended from a small tree-dwelling reptile that spent its life jumping between branches. This creature would have spread its limbs, and used flaps of skin attached to its limbs and body to help it to land gently on the ground. Over many generations the fourth finger on each of its front 'arms' would have grown longer, making the skin surface larger and enabling the animal to glide farther. Meanwhile, the competing argument holds that pterosaurs developed from two-legged reptiles that ran along the ground, perhaps spreading their arms for balance. Through gradual growth, the front arms would then have evolved into wings. This difficult issue will only be resolved with the discovery of earlier forms of pterosaurs. G 'It's very difficult to say how pterosaurs changed over time because the earliest fossils we have are of pterosaurs whose fourth finger has already transformed into a wing,' says Fabio dalla Vecchia, an Italian researcher. In fact, the earliest known pterosaurs came from the mountains of northern Italy, where he has spent years searching for flying reptiles. These species have shorter wings than later forms, but there is evidence that they were skilful fliers, capable of catching fish over open water. Proof of this has been found in the fossil of a Eudimorphodon, a 215-million-year-old pterosaur found near Bergamo, Italy. Under a microscope, several fish scales can be seen in the abdomen of the specimen -the remains of the pterosaur's last meal. H A different but equally impressive sight is the life-size model of Quetzalcoatlus northropi, which stares down at visitors in the Museum of Flying in Santa Monica, California. It has a beak the size of a man and wings wider than those of many of the planes exhibited nearby. This pterosaur had wings over 11 metres wide, making it the largest flying animal ever known. J As we walked beneath the Quetzalcoatlus model in Santa Monica, MacCready pointed out its similarity to sailplanes, the most efficient kind of aeroplanes. Both have long slender wings designed to fly with minimum power. During flight, sailplane pilots routinely search for places where heat rises from sun-baked earth, creating hot air currents called thermals. Undoubtedly, Quetzalcoatlus would have used thermals as well, lazily circling over the river deltas that once covered parts of Texas. K The triumphant reign of pterosaurs ended with this giant flier. At the end of the Cretaceous period 65 million years ago, a meteorite or comet slammed into the Earth. That calamity - and other events-wiped out roughly three quarters of all species, including all pterosaurs and dinosaurs. But before their disappearance, pterosaurs enjoyed unequalled success. They flew into sunny skies before any other vertebrate. For 150 million years they sailed the winds on the strength of a fragile finger. What a glorious ride they had. You should spend about 20 minutes on Questions 28-40, which are based on Reading Passage 3. Reading Passage 3 has eleven paragraphs, A-K.
35 ABCD He refers to the difficulty of determining how pterosaurs evolved without further evidence. 36 ABCD He failed to interpret the evidence before him. 37 ABCD He gave an appropriate name to the first pterosaur that was discovered. 38 ABCD He mentions the ability of pterosaurs to take advantage of their environment. Choose NO MORE THAN THREE WORDS AND/OR A NUMBER from the Reading Passage 3 for each answer. 39 So far, evidence of a total of pterosaurs has been discovered. 40 The wings of Quetzalcoatlus measured more than across.